Bread is an important source of fibre in the diet and provides a quarter of our daily intake. Medical reports and nutrition experts stress the importance of fibre in the diet, particularly cereal fibre. Ensuring we get enough fibre helps prevent chronic conditions such heart disease, diabetes and some cancers; as well as constipation and other bowel disorders. Eating more carbohydrate-rich starchy foods such as bread, potatoes and rice may also help reduce coronary heart disease. 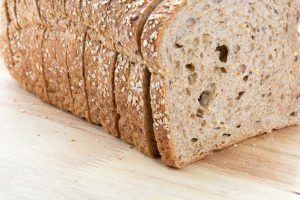 Six slices of wholemeal bread would provide more than 50% of the average fibre requirement for adults; brown bread would provide around 40% and white bread 22%. The current average consumption of bread is less than three medium slices a day. As long ago as 1991 (when bread consumption was comparitively higher), Dr. Roger Whitehead, then Chairman of the Government Panel on Dietary Reference Values says “if everyone reduced fat and sugar intake as recommended, and compensated by eating an additional two large slices of bread a day, it would have a dramatic impact on the nation’s health”. * That remains the case in 2013. Wholemeal and brown breads contain more fibre than white bread. Six slices of wholemeal bread would provide more than 50% of the average fibre requirement for adults; brown bread would provide around 40% and white bread 22%. 70% of the bread we eat is white. For all those who prefer white bread but want more fibre, there are varieties such as half-and-half or best-of-both which provide more fibre than a plain white loaf. The label will tell you which are the high fibre varieties. A high fibre diet is not suitable for young children. The most widely accepted method of measuring fibre is called the AOAC method. However, some companies continue to use the ‘Englyst’ method of measurement. The different methods have slightly different definitions of what should be included as fibre. A medium slice of bread weighs approximately 35g. *The Committee on Medical Aspects of Food Policy (COMA) Report on Dietary Reference Values (August 1991) recommended that there should be a 50% increase in the intake of dietary fibre. **Dietary fibre is defined as “non-starch polysaccharides”. Processed cereal products also contain resistant starch which is not digested and has the same function in the body as non-starch polysaccharides.